William Jones, one of the last Buffalo Soldiers, was also a U.S. Army Master Sergeant, Prisoner of War (POW) in Korea and successful entrepreneur. Jones was born in Tamo, Arkansas to farmers Joseph and Elizabeth Jones on July 15, 1918, the youngest of seven children. Jones grew up in Kansas and attended the “colored school” in Coffeyville, Kansas. On March 5, 1941 at the age of 22, he enlisted in the U.S. Army at Fort Leavenworth, Kansas. 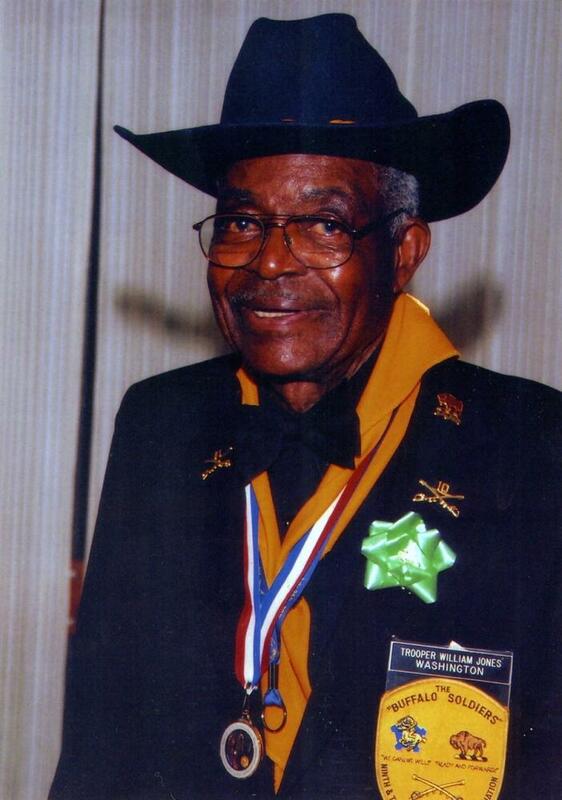 He was assigned to the 10th Calvary in Fort Riley, Kansas becoming part of the last generation of buffalo soldiers. In the 19th Century Buffalo Soldiers served on the western frontier but between 1898 and 1905 they fought in Cuba, the Philippines, and China. When the U.S. entered World War II in December, 1941, the 10th Cavalry was deployed to Camp Lockett, California where they patrolled the Mexican border and provided security for the railroads and bridges on the west coast. In 1943, the 9th and 10th Calvary were integrated into the Army Air Corps with the mission of building airstrips in North Africa and Italy for B-17 bombers. Beginning in March 1944, Jones was assigned to Casablanca, Morocco and later Naples, Italy. After Nazi Germany surrendered on May 8, 1945 V-E (Victory in Europe) Day, Jones was deployed to Manila, Philippines, where he again built airstrips for B-17 bombers to fly deep strikes into Japan. Before his unit became fully operational, however, atomic bombs were dropped on Hiroshima and Nagasaki, Japan ending World War II. In December 1945, Jones’s was assigned to Fort Lawton, Washington and the following year his all-black unit was designated the 503rd Field Artillery with the 2nd Infantry Division. The unit deployed to Pusan, Korea on August 3, 1950, after the start of the Korean conflict. Three months later, while the 503rd was moving toward the Yalu River, they were overrun by Communist Chinese forces and Jones was captured and held in the Pyok-Dong POW camp. For three years he survived horrendous conditions that saw eight to ten captives die each night. Jones was released on September 5, 1953 at the end of the Conflict and returned to Tacoma, Washington as a hero. In 1954, Jones, now in an integrated Army, was assigned to the 546th Field Artillery Battalion at Fort Lewis, Washington. After 20 years of military service, he retired in 1961 as a Master Sergeant in El Paso, Texas. During his service Jones was a truck driver, artillery mechanic, supply clerk, and marksman/ sharpshooter. After military retirement Jones started a thriving recycle and vintage antique business in the hilltop area of Tacoma. To keep the memory of pioneering black soldiers alive, in 2004, he opened the Ninth and Tenth (Horse) Cavalry Museum in Tacoma. Jones lived in Tacoma, Washington for 55 years, with his wife Hannah, who died in 1972. William Jones died in Tacoma on December 3, 2009 at the age of 91. He was survived by his four children, Willie Lee, Jacqueline Jones Hook, Marilee Jones Scarbrough, and Gwendolyn Elizabeth Jones. Service Record beginning, March 5, 1941, Induction Record, Enlistment Record and Reports of Transfer and Honorable Discharge, 1941-1960 (DD-214), Military Service Records: Department of the Army, Washington, D.C.; Ninth and Tenth (Horse) Cavalry Association Newsletter (September 2003); Oral Presentation by William Jones on October 18, 2008 at the Veterans Memorial Museum in Chehalis, Washington.